I am reading a book called "Stat Shot" by Rob Vollman, and it is fascinating. It also makes my brain hurt, but that is just because they are smarter than I am. But what they are saying makes basic sense, even if I don't understand the nuances of their math. I am not close to finishing yet, however I see a tool in there that would allow me to see how close Oliver Bjorkstrand is to being a late draft Kane. I still have more math to do, and that is going to be a challenge. Until I have conquered these formidable calculation demons, I have to rely on what is frequently called the 'eye test' by those trying to discern understanding from the competing analytics and 'scouting' camps. While it is true they both have their merit, I don't have the wherewithal as a solo blogger to undertake an analytics based assessment of what I am going to say. 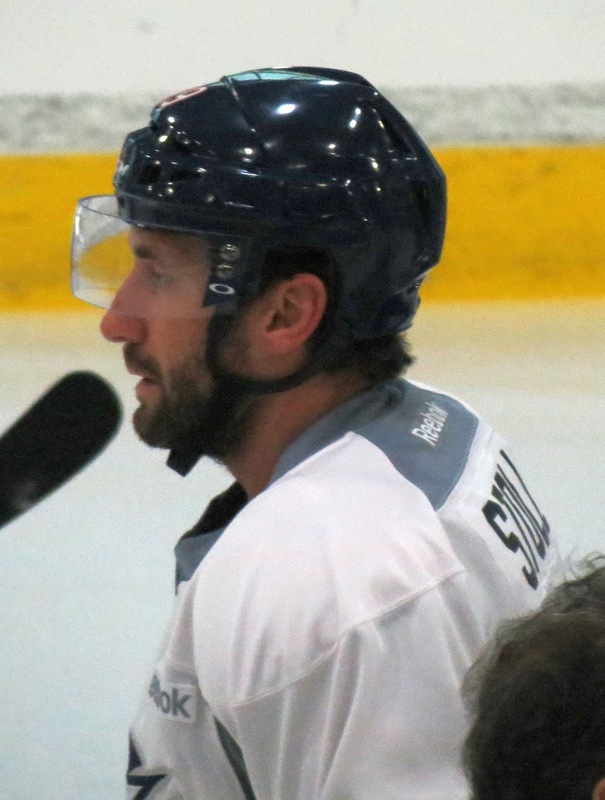 But in drills Saturday morning, watching group 2 (not a good sign) players I watched each player coming down the slot on a drill, and there was something different about Jarrett Stoll. A guy on a Player Try Out agreement (PTO), the CBJ management owe Stoll nothing more than a try. But when he skates down the slot with the puck, you see him checking each corner, assessing the goal tenders approach to defending the shot, and then his counter. There was a lot going on every time he had the puck on his stick. Stoll has made some mistakes. I assume he has atoned appropriately for those mistakes. Now he is here on a PTO. There is a part of me that thinks he has something to offer the organization, whether at the AHL level or the NHL level. He could be signed for a reasonably close to the minimum one way contract, and if he played in the AHL and lead the Monsters to another Calder Cup it would be the best thing he could do to land a spot with Vegas. The risk on a one way contract is slight, as the worst case is that someone claims him when you are sending him down. My assumption here is that sending Bjorkstrand back to Cleveland at the same time you send Dubois back to Cape Breton will soften the blow for all involved. You keep Stoll early, when we need to win, and bring Bjorkstrand up once he gets hot. He won't be the first young player who was sent to the AHL to get hot. Meanwhile, you send Stoll or Campbell down to Lake Erie to help lead that team to the playoffs again, at an NHL salary. It is a good cross walk between the two organizations. There is nothing at this point to suggest that David Clarkson won't be on Long Term Injured Reserve (LTIR). That would give them plenty of cap room for a $650 k one-way contract for Stoll. About the 3 day left mark in camp, based on continuing performance, is when you do this contract, in my opinion. All that aside, Stoll could be a wild card down the stretch, and the approach is to prepare him for that eventuality. A good start to the season, a calm/down middle part of the season, and a push to the end and into the playoffs is what we should be looking for from Stoll. I hope it can happen that way. Agreed 100%!! His ability to win face-offs and kill penalties should put him on the team.